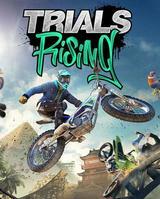 In Trials Rising, the player controls a rider on a physics-based motorcycle from the start of the level to the end while navigating a number of obstacles. The game features obstacle courses set in various parts of the world such as the Eiffel Tower and Mount Everest, and the player can compete against each other in local and online multiplayer. I’m old school. My first motorcycle game was Kikstart II (1987) on the Amiga. It was very much like Trials. You drive your bike from left to right trying not to crash. In that game there was a speed limit on each obstacle so you couldn’t just nail it. You had to find the perfect balance to go as fast as possible. My favorite feature of that game was building my own courses. I was excited when Trials first came out because I was immediately reminded of Kikstart, but the first Trials games where exclusive to Xbox, and I’m a Sony person. So I had to wait until Urban Trial Freestyle was released to PlayStation Vita and I loved that game. I think it’s my most played game for the Vita. Then Trials Fusion came out for PlayStation 4 and I didn’t like it at all. It got technical very quickly and I couldn’t get through the levels. I got stuck on some jump I couldn’t perform for the life of me. So that was a huge disappointment. The need for Trials stayed with me and when Trials Rising came out for Nintendo Switch I jumped on the wagon. I love that they learned their lesson and made this game more fun for beginners. There are tons of easy levels where you can just fool around and play because its fun. The tutorials are also great and I’ve learned to become a better Trials player. I guess if I go back to Trials Fusion right now I would manage to get past those impediments I experienced before. I really dislike the macho aesthetics with skulls everywhere and blowing up the rider. The rag doll physics is the main problem I have with letting my son play this because when you crash it looks brutal, and it's so unnecessary. When this game gets hard, it ramps up the difficulty really quickly and I spend an hour on each course just to get a silver medal, and yet its not enough to progress. You need to collect medals, to get XP, to level, to open up new courses but even if I have silver medals on everything and quite a few gold medals it is still not enough to progress. The game becomes a grind and that is where it dies for me. I can’t continue because my progress is locked in. The loot box system is awful. As you level up you get crates of stuff to make you and your bike look cooler. But in fact most of the stuff you get, you already have and the new stuff doesn’t look cool at all. It also takes a long time to unlock new bikes. I’m at level 45 and only have tree bikes at my disposal. This game is really fun for the first couple of hours. I wish they hadn’t made it so macho. I wish that they’d ramped up the difficulty more gradually, and that they didn’t lock away the experience if you’re not good enough. Just let me play, and let me have fun with your game. Ok?